Heat coals or gas grill for direct heat. Remove excess fat from pork. In small bowl, mix all Cuban Rub ingredients; rub evenly on both sides of pork. Cover and grill pork 4 to 6 inches from medium heat 8 to 10 minutes, turning frequently, until pork is no longer pink and meat thermometer inserted in centre reads 160ºF. Garnish with mango slices. Substitution: No cumin seed? Use 1 teaspoon ground cumin. Serve With: Round out these flavour packed pork chops with corn on the cob and cooked rice tossed with black beans. 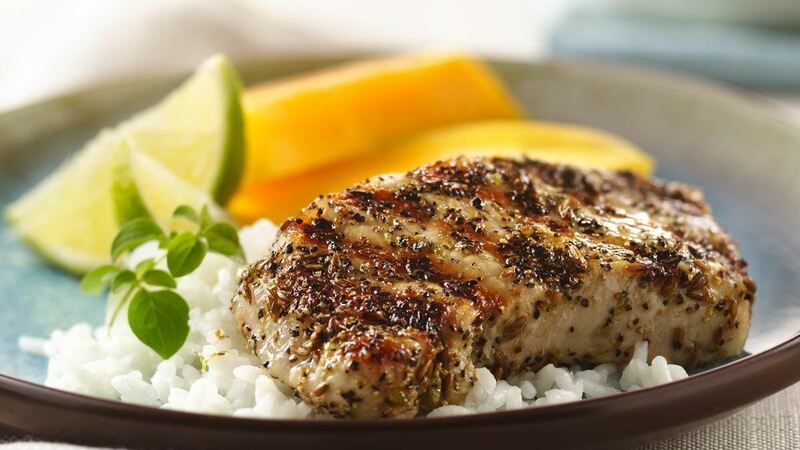 Variation : The Cuban Rub is also delicious on chicken breasts.